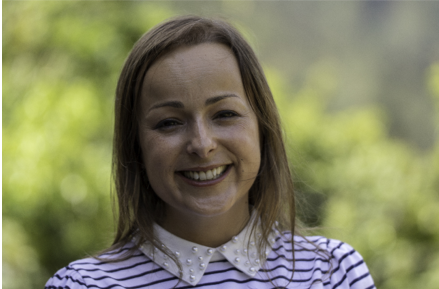 Learn more about the Story of ‘EKUI – For a world without communication barriers’, from its creator, Celmira Macedo. EKUI is a line of playful and didactic material for more inclusive communication, without barriers. EKUI was designed to develop language and communication, psychomotor skills, critical thinking, social and emotional intelligence and imagination and creativity. Celmira Macedo will provide some advice and share the critical stages of the project since having the idea for a new solution to overcome the barriers of communication she faced working in her profession – as a special education teacher for people with disabilities – up to the development of a new, disruptive methodology of Inclusive Literacy and Accessible Communication, which has since been implemented in nearly two hundred Portuguese schools over just two years. What is the social innovation EKUI about? EKUI is a new approach to the way we want the future to be; that is, it’s a new methodology that is disruptive, that fights traditional learning methodologies which by themselves are often castrators that do not include all. 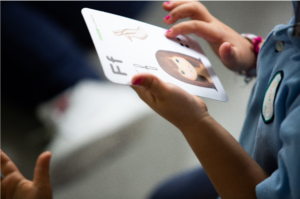 EKUI, meanwhile, is precisely this type of new l earning methodology – an inclusive learning methodology with a universal design, inclusive of all: children with learning difficulties, children with a disability, adults with phonetic articulation problems, children or adults with speech problems, people who have suffered a stroke, people in rehabilitation, all are included. In the background, there is a methodology for everybody. 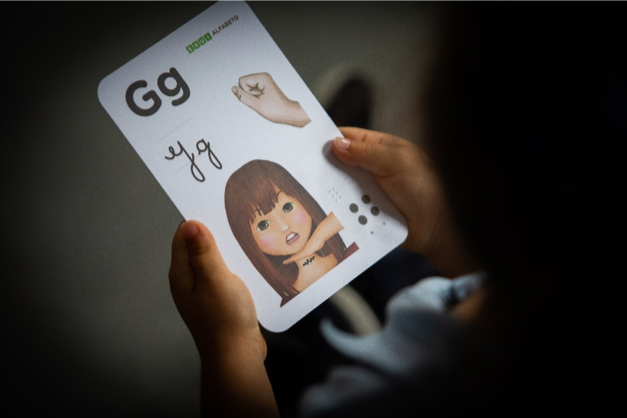 It is the only methodology in the world, curiously, which includes four forms of communication: Braille, sign language, Portuguese spelling and the phonetic alphabet. Mainly, I started EKUI for two reasons. The first reason was from when I was working – I’m a special education teacher – and I was working with a group of children with disabilities, autism, Down Syndrome, etc., and at the time I was doing my PhD in Salamanca, studying teaching methodologies, on Spanish sign language. By that time, I was very impressed with a student called Francisco, and such traditional learning methodologies were not able to help him learn, read or write. He barely spoke. And because of this condition, he was usually excluded from the class because he had a very aggressive relationship with his peers. For many months I tried to help Francisco, and for many months I failed. In my PhD, I was researching learning methodologies. How could I help that boy to learn, read, write or speak? To have no barriers to communication, whether oral or written barriers. I began to study, to research and to find various things. The first thing I discovered was that in Portugal alone, there were more than a million and a half people in the same condition as Francisco. And 500,000 Portuguese leave school without learning to read or write … 5.2% of the population is illiterate. Thus, traditional learning methodologies are not able to educate a whole slice of the population. Then, I also learnt that 600,000 people have some form of disability or communication problem. And I also discovered that 600,000 Portuguese, for various reasons of physical health, cannot communicate. In Portugal alone, a million and a half of people suffer from these conditions. So, from a private finding, which was very much mine, very particular, I discovered a problem; basically, a social problem. The second conclusion I reached: the solution to the problem was through the creation of a learning methodology that could be for all, which had several components, mainly a practical component, a component to facilitate this learning. Another thing I discovered in my research was that if I used technologies in association with this learning methodology, I could increase the level of focus and attention of my students. Mixing all this, I came to EKUI. A methodology that joins several forms of communication (with a physical and digital component) capable of unlocking the communication problems of my students. At the time, I wanted to apply EKUI’s methodology only in a context where there were children with disabilities, but then the project faced a very large externality. I noticed that in schools, EKUI could indeed benefit children who had some problems but also enable other children to reap the benefit as well. The great positive externality of EKUI is that, regardless of whether I thought it could solve the problems of children with learning difficulties, so many other children were benefiting from it: learning the alphabet (they learned the alphabet faster than in previous years, from the teachers’ point of view); developing phonemes in the context of the classroom (that is, there were children who did not need to attend speech therapy as they developed these phonemes in the classroom); and children in speech therapy with therapists using the EKUI methodology were able to develop phonemes faster while also saving families´ and public money. Another important thing: We were developing true citizenship skills. We have children who, at age three, think there is a language, with dots, which children learn to talk with blind people. Children who say ‘I’ve learnt with my hands to talk to deaf people’. I had my students. I had the problem. I was researching and looking for a solution. I developed some very ugly letters, which had the Braille, the sign language, the spelling and so on. I had these very ugly letters and I worked with them and had very good results with my students. RTP (Portuguese national television channel) went to the LEQUE Association and saw me working, with those letters, with the users of the LEQUE Association. And they said to me ‘why don’t you apply for a social entrepreneurship bootcamp?’ And I said, ‘okay’ (laughs) and there I was in the Bootcamp (laughs). The challenge then was to make 30 people, who were also there with 30 other ideas, lose, so that I could win (laughs). And that’s what happened. I won and it was the starting point to get funding for the project. We raised the first ten thousand euros to create a pilot. The Bootcamp award brought us the support of the EDP Foundation. The first five years were to collect a set of awards, to validate the pilot, to construct the design, to understand everything, from the size of Braille to the thickness of Braille, to the size of the letters, paper. Four years of very rigorous scientific and technical validation to detect scientific errors. My advice to social entrepreneurs, people who have dreams – social entrepreneurs are dreamers, they are crazy … Do not neglect the scientific component; that is, always validate the ideas, validate them scientifically, validate them socially … Ask questions like ‘Who would care for this?’. I would say ‘This matters to the teachers’, and some people would say ‘I do not see it, nowhere, no indication that this matters to people’. Then I realised that I had to develop tools to validate my ideas. So I developed a national survey in Portugal, with ten questions, asking people ‘if there was a material like this would you be interested in buying?’ ‘Do you feel the need to talk to deaf people?’ ‘You feel the need to break communication?’ and had a response rate of 1700 enquiries. That was followed by further scientific validation at the Instituto Politécnico de Leiria, with 300 researchers who performed the pre-tests and post-tests, to validate the impact on learning. Do not neglect validation, to show that whatever you are doing is being done well. My initial fear was precisely to conclude that I was not right. I was scared, thinking ‘it might only work with my students because the methodology was applied by me’. Or ‘it might only work with my coaches because they had been trained by me’. That was my biggest fear. That’s why I got very involved in the scientific validation, doing a lot of research, reading a lot about it, and going to the field and validating scientifically what my hypotheses were. To see if it would even work. EKUI’s intellectual property is mine. The EKUI project was developed under the scope of the LEQUE Association. The first step was to validate the product, validate the pilot and then start implementing the methodology in schools and measuring the impact. The first project was supported by a group of entities: António Manuel da Mota Foundation, Alfandega da Fé Municipality, Missão Sorriso and more. It was a very short edition of 2000 copies, precisely to be a kind of ground experience. The edition went very well. It sold out in the first year and then we applied for financing to the Portugal Social Innovation Partnership for Social Impact with increased negotiating power. The alphabet helps to unlock the barriers of communication; if a deaf person is here, we may not know how to say ‘hello’ in sign language, but we can write ‘hello’. Six years ago, 70% of the deaf community left school without learning to read or write. Almost 90% of the blind community still leave school without learning Braille. This is a serious finding. More serious still, it concerns mental health. We do not realise that children in schools with some form of disability or incapacity are victims of bullying. 60% of bullying problems involve children with some kind of learning disability, children with dyslexia, for example. It is the mental health issue for these children. What can we do, to work on a methodology, which assumes that all forms of languages are important? Sign language is important because it helps me to learn the alphabet faster. I am making a letter, associating a concrete gesture with a letter that is abstract. This assumption was important. It was working to positively market people with disabilities and change the belief system and value system. And it was important to the project. I started with Portugal Social Innovation support and receive training in the area of management since my PhD is in Special Education. I had to learn that there is something called a business model (laughs), I had to learn many management tools that have allowed us to look at the EKUI initiative today as a business that can be self-sustaining, as a business that has a model, which is very interesting from the social point of view. For every EKUI box we sell, we offer another. One is to create sustainability while the other is to create an impact, because we offer it in schools. We offer EKUI in schools as part of schools’ commitment to implement the methodology in a classroom context. Each box we offer impacts at least 20 students. Then we began to think ‘we have to train the teachers’. At the moment, we have trained almost nine thousand teachers. We are already in almost 200 schools, at the national level, implementing EKUI’s methodology. Children are having their first contact with language, with oral language, with written language, in kindergartens and schools (first cycle of studies). We are changing the lives of families, a little bit, with the impact we have on people. Media attention came, a little, in the framework of the LEQUE Association. All of the projects I’ve dreamed about and carried out, within the framework of the LEQUE Association, were innovative projects, and there was another particularity which is part of the values I defend, intellectual honesty. That is, everything I say I will do, I really do it. It may take longer, I can do it smaller, but I prefer to do it well, for it to be well done, with sustainability and with transparency and intellectual honesty. And that somehow allowed me to gain respect, first of the media, first local media, then regional and then national. They said, ‘there goes Celmira, it must be an innovative idea, different, but if she says it is working, it’s because it is working’. Another important aspect is to always give the perspective of life stories, the stories of people who have benefited from the project. Because I can speak very well about the project, but if Marta is here to say that ‘I am blind and now I can work with my son’, then that definitely has a greater impact. Another issue is knowing how to communicate well, knowing how to communicate clearly, accurately. If this is the goal I have, if I advocate a project that has no barriers to communication, then I have to communicate without barriers as well. I’ll tell you a secret, which I’ve come to discover over time. Write down everything we think we can say. I did not do that before, and it confused me a lot. I had already had two strokes and it was in that framework that I created EKUI. At that time, I had a stroke and could not communicate with others. We say ‘things’, words come out of our mouths that sound silly when what we really want to say is ‘take me to the hospital’. Then I realised how awful it is to not be able to communicate. I’ve been in trouble, so I value the solution. And I fell in love with the problem, because I think that’s the other secret. We have to know the problem well. We have to research the problem deeply. And with regards to communication, one of the secrets is when I’m more timid, when I’m not sure what I’m going to say and I have to structure my thinking and write a few lines. I’ll talk about this, this, this and this. And so, maybe, it goes well. With work, everyone can. Sometimes, weekends are over, vacations are over. But we want to make dreams come true and we have to know how to live without other things. It’s about choices and I think I made the right ones. We were not sure the idea was good. Therefore, you have to experiment, hands on the ground, to raise hypotheses and try to confirm them. And having the honesty to say, this is no good, this is wrong and take responsibility for it. There have been many paths we have travelled that have not gone anywhere. Being in an IPSS (social economy entity) is much more difficult because then the paths that we can trace are limited, there is no flexibility. Not everyone understands what social impact is. There are people who do not care about social impact; instead, they are interested in financial impact or in short-term sustainability. They think ‘To help children of the whole country, I do not care. I’m interested in helping the children I have in my village, and there are only ten of them. I’m only interested in those.’ But I would only be happy if we, I, could reach the two million children in Portugal who are at school age. When this moment comes, maybe I’ll be happy. For now, I’m not. The other thing that entrepreneurs have to do is, they have to dream big. You have to believe it. Because being a social entrepreneur implies being part of the social economy, being part of the third sector, which means working without money. It is to work, to do volunteer work. I do not disagree, at any moment, with creating your job. If it was 10 years ago, I would still have done that. I would have given up my career to create my job within this organisation. Unfortunately, I did not do that, I thought more about other people. For those who are starting, who may not have money, only dreams, I think it is important to have the financial capacity to do it. It is important for the social entrepreneur to focus on the solution instead of being worried, constantly, about whether or not they can pay the bills. This probably makes the difference between walking at 100 km/hour, or walking at 20 km/hour, having to stop at all stations. Having the financial capacity is important. When you do not have it, you do not have it, but there are many ways you can get financed today. Over the years, I have submitted many applications. Some have been approved, but I also received many ‘no’s’. I’m a bit of a crack at making applications (laughs). The factor that really made the difference for scaling EKUI was the innovation. We managed to get the first message to a small group of followers: EKUI was an innovative project. The first followers were essential and comprised partner organisations and schools that were able to really understand the project, and slowly we managed to spread EKUI. Well, we have been implementing the project in the market for two years now. At first, there was a lot of work to get schools and city councils to present the project. We had many ‘no’s’, but now the process is quite the reverse. Now we receive requests to implement EKUI methodology, and almost every day we have to say ‘no’ because we only have sustainability to be in the North (region), a little bit in the Centre (region), almost to the Lisbon area. Nevertheless, we already have training scheduled for Algarve (region) but we cannot go to all sites. At this stage, we do not have the team and we cannot afford to pay more people to implement EKUI at all of these sites, but we will keep working to be able to scale as much as possible. That’s the idea. I cannot pretend I can change the world (laughs), but things have changed… We have already changed schools … Most of the teachers who are implementing the EKUI methodology have a 20-year career. A teacher has learnt from a certain method, then suddenly someone introduces him to a completely different method, and then he has to teach using a methodology in which he was not trained, but it is a methodology close to him because it makes him remember how he himself learnt. Just think ‘How did you learn to talk? From looking at your mother’s mouth.’ We learn the phonetic alphabet this way. ‘How did you learn to read? By associating the sound of speech with the sound of writing’ – that is what we did with EKUI. ‘How did you learn visually? By identifying visual components, and associating them with more abstract components.’ And when I have two hundred schools fully integrating this method into their classes, I already feel that there is a big change. In 2015, we started to implement the EKUI methodology in two schools, in Vila Nova de Gaia (city). We have applied for funding to Portugal Inovação Social to help implement the EKUI methodology in 60 schools. We are already implementing the EKUI methodology in 133 schools, with more than 70 aligned, waiting. At the end of the project, we will have 250 schools, in just three years. It’s wonderful for us. So I think we’ve already changed something. If we managed to change a teacher, and I’m not talking about the 9000 teachers we have trained, only 13% implemented the project. I’m talking about those who have actually implemented it. Whether they are 100, or 200, getting the methodology implemented, every year, with 20 different students, this will create a mass of people who, in 20 years, will look differently at sign language, Braille, phonemes and people with disabilities. Financial sustainability will take a little while because teachers have a culture where they get used to everything for free. Everyone says to us, ‘It’s interesting but why don’t you make it free?’ Because we already offer enough and we also have concerns about sustainability. I think sustainability will take longer than we had anticipated, but I believe we will be sustainable, across the whole country, and it will not take many years from now. Having a product that can be sold by itself is the other part of the 50%. It is good to have a good idea, but we must also have a service/product that can materialise that idea. In the market, we sell a product that is, in fact, a literacy methodology. The product materialises what the methodology is. A father can buy the EKUI box and can also attend training on EKUI’s methodology. I am now writing the EKUI manual since teachers and parents have asked me for strategies. A volunteer from the management area, David Tomé, told me, ‘we have to have a manual’. I replied, ‘a manual, how?’ and then he said, ‘I already figured out what kind of manual. A manual on types of use’, providing ideas and games using EKUI cards such as, for instance, how to build a closet with shoe boxes: place an EKUI card in each box, where the child will place objects that begin with the letter displayed on the card. It is very important to develop strategies to promote the product’s use. Do not give up (laughs). Never give up. Never. When people tell you ‘this is no good, it will not work’, if you believe it will work, then never give up. That’s the message I want to give you. Always believe, but do not be stubborn. When we are sure, when we are aligned, when we realise scientifically there is an impact, sometimes people do not understand at first, but if ideas make sense, sometimes it is not people’s fault, maybe you didn’t explain it well, maybe you didn’t communicate it well. And I’ve spent years not communicating well. It was an inner learning process. Do not give up, because if we give up, with the first ‘no’ we will never make it…. The first ‘yes’ comes on the thousandth time (laughs).